Comfortable accommodation in Centurion. Triple room (ensuite) or twin room (private bathroom) in main guesthouse. Discount for group bookings or visits longer than 7 days. 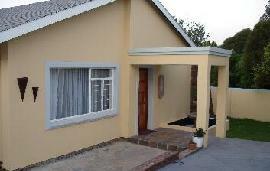 Self-catering 2-bedroom cottage also available with queen bed and twin beds. Fully equipped kitchen and TV lounge. Everything in kitchen is new and all that you will need to be able to prepare your own meals (fridge/freezer, toaster, coffee machine, kettle, gas stove and oven, etc). Washing machine and tumble dryer in cottage. Own lock-up parking and private front-door. Access to guesthouse for breakfasts and relaxation. Swimming pool and entertainment area. Opposite Zwartkops High school and close to Centurion CBD. Freshly prepared breakfast included.